There is one thing I want to ask, im a BT broadband customer but dont have BT TV pack included. So i had to hide these BT channels off the tv guide. I too have a T2000 Humax Retail Box and have just switched my broadband from Sky to BT. I also do not have a BT TV package. I note you mention hiding the BT Channels that are not available to us, but there seems to be so many. Does anyone have, or can anyone point me to a list of the channel numbers to hide? 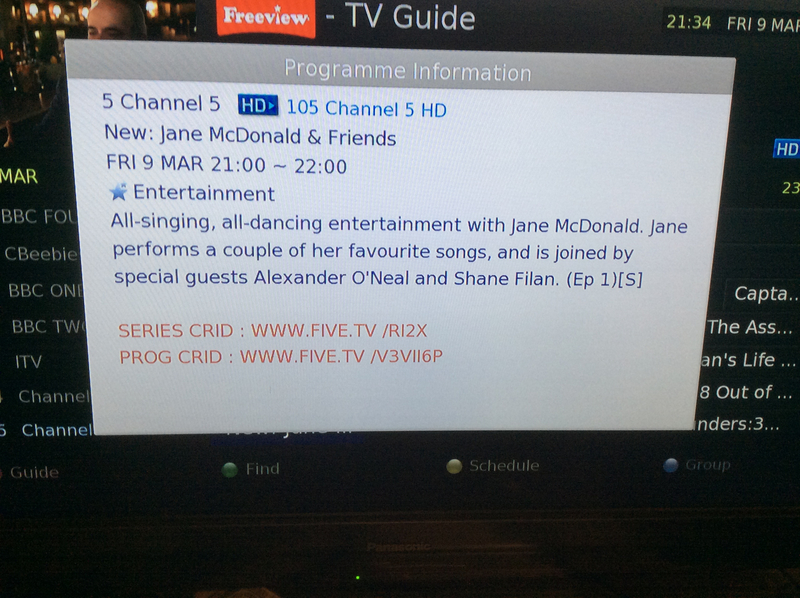 It varies depending on where you are, but this is from the Guide positioned on an SD programme currently showing. The Guide itself has been blanked out by the flash when I took the picture, but the eye can see it there above the Action Panel. Thanks @roy that is different to what I was expecting, I thought it would be in the box on the right. What about if you do info from the mini guide is it the same layout. Thanks Visionman. I will get them all hidden. Looks like I am hiding all of the 300’s, 400’s and 500’s channel numbers. For the avoidance of doubt, I am interpreting ‘the mini guide’ as the thing that comes up when you down arrow on a live programme you are watching. 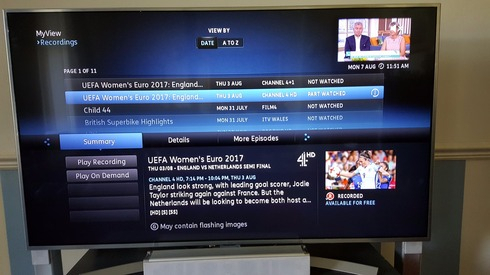 What your calling the mini guide from pressing the blue YouView button is known as the main menu. looks exactly like the Flatpack Empire display, above, for BBC1. ITV and Channel 4 are the same, but without the Watch in HD option, though Channel 5 offers this, as does BBC2, but no other channel there, not even BBC Four, whose presence is anyway pretty inexplicable at 13:55, as it just shows a placeholder until 19:00. 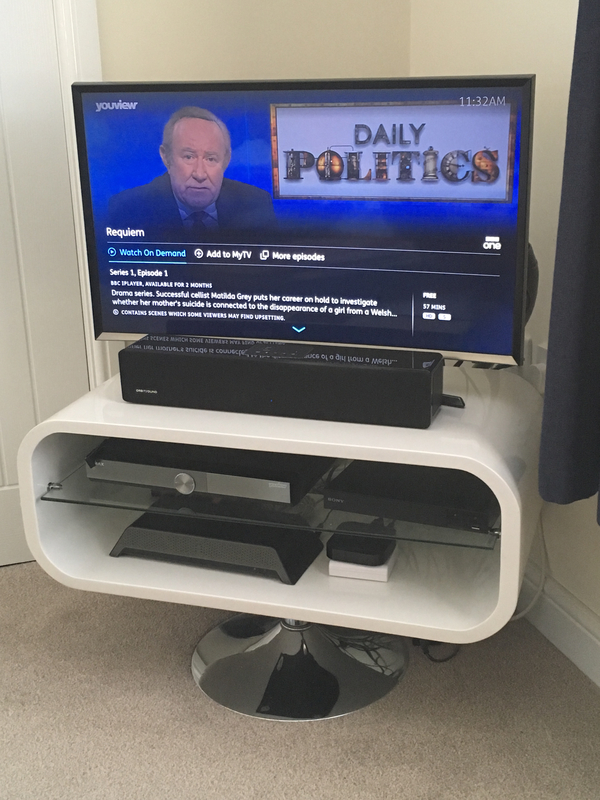 Excellent use of scarce real estate, not, YouView! Just wanted to say "nice work" to Roy for posting all those screenshots, will be helpful to many I imagine. Also will the new bookmark feature be available on the forward main guide for on demand channels? BBC etc. Example - press record to record episode - series or add to my TV. 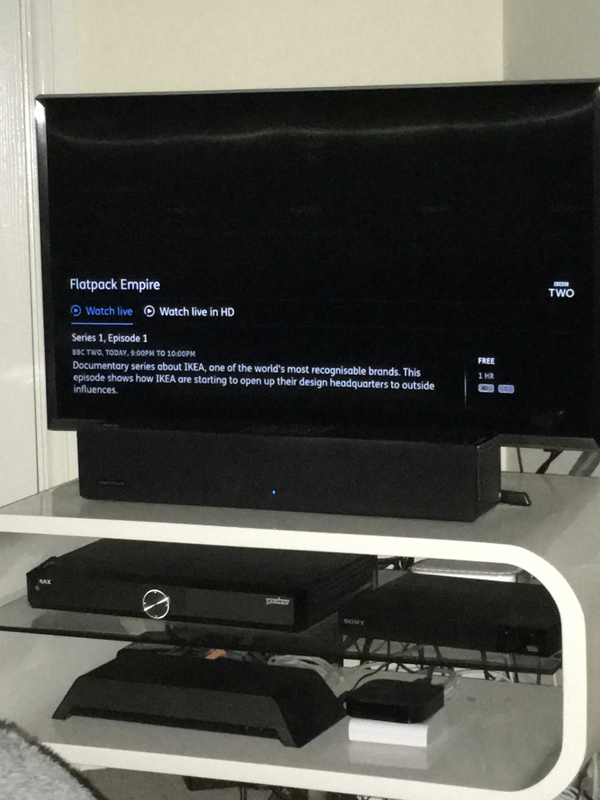 A new Watch List area can be found in MyTV on the main menu. Create your own catch-up library with Watch List ready to access whenever you want. When you see a show you want to save for later simply press the record button to add it to your list. You can add shows from the Guide, the Miniguide, Search and even the new Discover section." Hi @Adrian1 - this would be dependant on the forward EPG entry of interest already being listed as 'going to be available via on-demand' (or even already available now even though it is yet to air live). Provided that data exists in the forward EPG then it should be possible for the new watch list feature to offer the 'Add to MyTV' option in these cases. Whether it does is something that would need testing (I'm not near a box now to look), but it probably would only work now in a very small number of cases where the future item is already available via on-demand so the data is complete and the on-demand content actually already available even though it is yet to air live. If such forward data were not available, the watch list feature could still be modified to add speculative bookmarks for future content but the box would then need to resolve those once the item had aired and either drop them if it turns out they are not available via on-demand or complete them as a link to the on-demand content if they are. That would seem a confusing thing to do, so for this desire to work well it would be best to have on-demand data for future EPG items upfront. Item 63 in the consolidated list of improvements and feature requests is all about resolving such triple recording clashes by leveraging forward EPG on-demand data, bookmarks for on-demand content, and if available on-demand content downloading. Within that idea it is point 4 that matches up with what you are describing. Thank you very much for your in-deth reply. 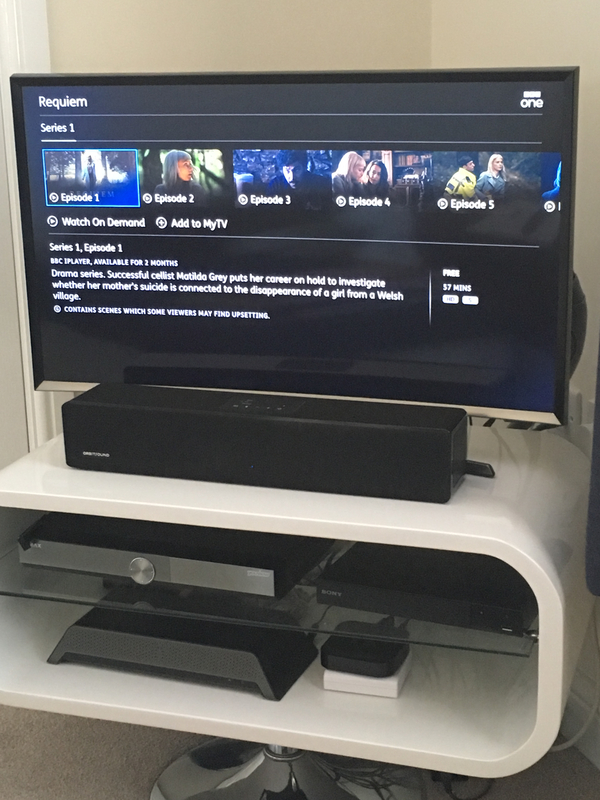 I have another question, will 'more episodes' be returning to the programme info section? As in pressing info on the main guide. YouView never make preannouncements, and anyway this is in BT’s hands, so you would be better off asking on the BT TV forum, if there is any information BT are prepared to release. But it’s pretty unthinkable these features won’t come to the T4000, and indeed every BT box except maybe the T1000s (and it will possibly come even to them); the question, I think, is when, not if. I have a Humax DTRT 2000 , the words 'Watch list' have recently appeared on my TV screen and I was at a loss to know what it meant was. I selected the information button and it stated if I pressed the record button during an 'on demand' programme it would be saved in my Watch List. I tried doing this and a message appeared saying 'On demand programs can't be recorded' . Can someone please explain what the Watch List is supposed to do if it is not a saved access list of on demand programmes . You can't add programmes from the forward guide. Try scrolling back and add a programme with the on-demand symbol. You can also add to the watch list from search and Discover. I'm hoping they will expand it to the forward guide. Thanks Adrian but I don't understand what that means. Bit of a bug here, I think then, or at least an infelicity. Going to 5, 7:00pm tonight 7 March, there is Extreme Winter Road Rescue, and it is available on catchup, as it has previously been shown. So, in principle, I should be able to set a Watchlist entry from it, I think. But I can’t; I can only set a Reminder, from Info, or a Recording, from the Record Button. And nothing there tells me when it was first shown, so that I can go back and set Watchlist from that entry perhaps. I can go to Search and find it, where I do get the option ‘Add to MyTV’ which I can put it in the Watchlist from. I think I should have the Watchlist option from Info as well as the Set Reminder option described above. I think ‘Add to MyTV’ should say ‘Add to Watchlist’ instead (or ‘Add to Watchlist in MyTV’ if you like); there are three things in MyTV, and I would like it to be clear that I am neither Recording nor Scheduling the programme. If I could add to watch list instead of set reminder I'd be so incredibly pleased! If I have too many recordings set then the option to add to watch list would be very useful. I also seem to have an issue that on the menu guide, when selecting a tile and pressing info you get the option to 'Watch live in HD' only on BBC and CH5 channels. 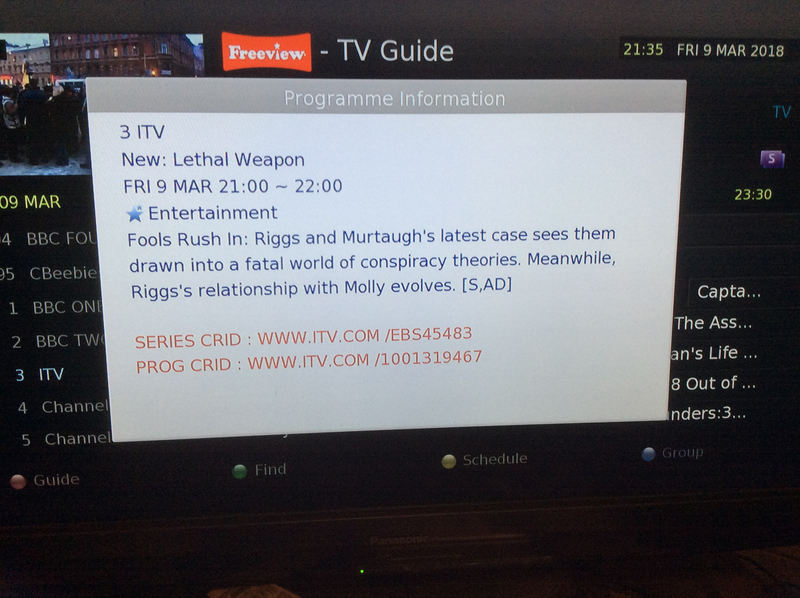 This option appears to be missing for ITV and CH4. Why? Because these channels don’t supply the metadata to support this? I presume the question mark means you don’t know if this is the case and are just asking a question the same as me. @Scott, that is a surprisingly deep philosophical question. Some might suggest I am advancing the issue by focusing on just one possible explanation out of the universe of possibilities your question opened up. Others would point to the question mark though, as you have done, and suggest that nothing I said advanced the issue, and may even have retarded it by excluding all those other possibilities. @Roy I just take it nobody really knows anything.. 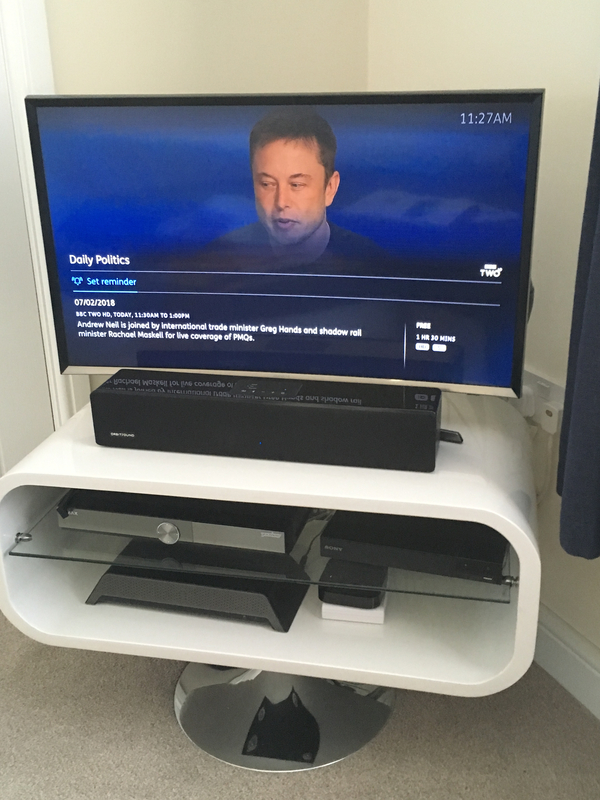 The available to watch in HD is I believe (meta)data that is made available to Freeview and I would presume YouView are also making use of the same data. Looking at a Freeview guide on a non YouView box this is what I see channel 5 , Channel 4 and BBC 2 SD . you will note that BBC 2 and C5 have the HD play marker and C4 doesn’t . 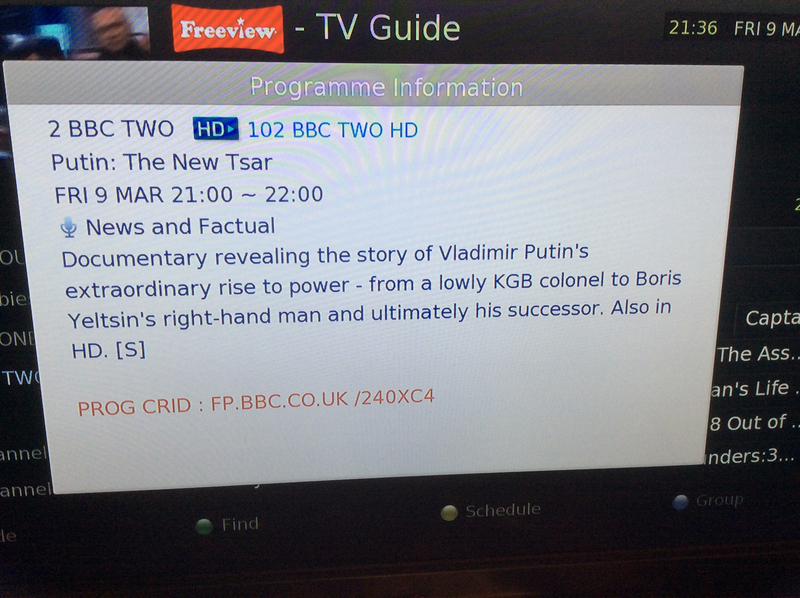 You've posted pics of BBC 2, CH5 and ITV!